The Advanced TIROS Operational Vertical Sounder (ATOVS) data processing system provides near real-time atmospheric temperatures at 42 levels (from surface to 0.1 mb) and water vapor mixing ratios at 19 levels (from surface to 200 mb) with a 40 km horizontal resolution derived from the AMSU-A and HIRS measurements on board the NOAA polar orbiting and European Metop satellites series. The primary functions of the system are to quality check the instrument data, convert it to radiances (or brightness temperatures), limb correct, cloud clear for the ATOVS, determine a first guess profile and compute the retrieval. Cloud detection is done using AVHRR channels 3b, 4, and 5. 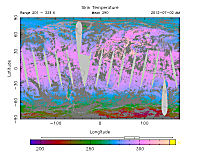 In addition to the temperature and moisture profiles, ATOVS products suite includes the AMSU-A brightness temperatures, HIRS channels radiances, layer temperatures and layer thicknesses (15 layers with 40 km resolution), geopotential heights, tropopause pressure, tropopause temperature, total ozone, cloud amount, cloud top temperature, cloud top pressure, layer precipitable water, cloud liquid water and total precipitable water in binary and BUFR format. The GOES Sounder consists of total 19 channels (18 Infrared and 1 visible), providing imagery at a 10 km spatial resolution, on an hourly basis over CONUS and adjacent waters. The products include standard imagery which is an image product of the raw sounder data and derived level 2 products (Clear-sky Radiances, Layer & Total Precipitable Water, Cloud-top retrievals (pressure, temperature, cloud amount), Surface Skin Temperature, Temperature and Moisture Profiles, Atmospheric Stability Indices, water Vapor Winds and Total Ozone). The derived image products include analyses of Total Precipitable Water (TPW), Lifted Index (LI), Surface Skin Temperature (SKT) and the Cloud Top Products (CTP). The CTP information is derived in a 1 km by 1 km gridded satellite field of view (FOV) format and data is placed into BUFR format. The GOES 5 km by 5 km gridded FOV Sounder Automated Surface Observing System (ASOS) is a text product used by the NWS at every forecast office and national center where an ASOS is present. The ASOS ceilometer looks upward into the atmosphere to detect the bottoms of cloud layers. This product compliments the ASOS measurements by providing information on the higher levels in the atmosphere. The product gives the current atmospheric conditions, cloud amounts (clear, overcast, broken, or scattered), along with the base and tops of the clouds in feet and the effective cloud amount of those clouds by station ID for each location reported. GOES Single Field Of View (SFOV) Soundings, retrievals are also being made at each pixel. The Infrared Atmospheric Sounding Interferometer (IASI) onboard the European Metop satellite, was launched in October 2006. IASI produces temperature and humidity profiles with vertical accuracies of 1 degree Kelvin and 10 % per 1-km layer respectively. The first priority of the IASI processing system is to generate radiance products from data ingested in a pipeline mode from EUMETSAT. These radiances undergo sub-setting, Principal Component Analysis (PCA) reconstruction, and global gridding. Subsequently these radiance products are distributed to users as BUFR, NetCDF and BINARY files. All levels of data products are made available at the user specified locations, as subset files, and as gridded subsets. These products are derived from the Cross-track Infrared Sounder (CrIS) and Advanced Technology Microwave Sounder (ATMS) currently onboard the Suomi National Polar-orbiting Partnership (SNPP) satellite and later will be available from the Joint Polar Satellite System (JPSS-1 and JPSS-2).